Slip-on trainers with the distinctive black and white checkerboard print from the Vans Anaheim Factory pack. 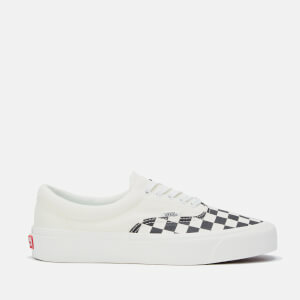 Paying tribute to the first Vans factory in Anaheim, the ‘Classic 98 DX’ sneakers are inspired by the original ‘Classic Slip-On’ with slightly higher foxing tape and glossed sidewalls. The low profile pumps are made from a heavyweight 10oz canvas and retains its characteristic elastic side inserts. Modern UltraCush sockliners and a padded ankle collar provide premium comfort. 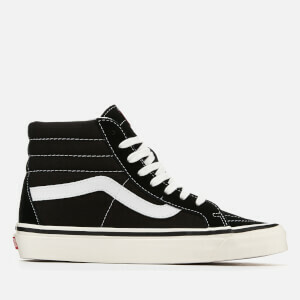 Complete with Vans’ signature waffle outsole for outstanding grip, a Vans 'Off the Wall' licence plate on the heel and a logo tab on the vamp. Upper: Canvas (10oz). Sole: Rubber.